The Boca Bearing Company is proud to announce the new Lightning Bearing Technology (LBT) line of ceramic bicycle bearings for hubs, bottom brackets, headsets and pivot points. Ceramic bearings are particularly well suited to both competitive and recreational bicycle applications. They are lighter, stronger and have substantially less rolling resistance than steel bearings. Ceramic balls are virtually frictionless as well as being several times harder than steel; as a result, they are faster and will last 4 or 5 times longer than standard bearings. Also, ceramic is 2/3 the weight of steel, and weight is always a factor in a bicycle's performance. The Boca Bearing Company now has inventory for every bearing size used by the most popular bike manufacturers. These bearings have been carefully developed to give the maximum performance according to the type of bicycle and riding application. The bearings are all fully sealed with a C3 fit that eliminates any friction caused by bearing compression in the hub housing or component. Customers can easily identify the exact bearings they need with our online Bicycle Cross Reference guide or by calling us direct toll free. To cover all the possibilities, Boca Bearing has developed two different types of sealed ceramic bearings for bicycles. The Yellow Seal, Ceramic Hybrid version has been developed to give maximum protection in the most adverse conditions, such as water, mud, gravel and dirt. The heavy duty seal makes these bearings maintenance free and lubed for life. The Ultra Seal, Ceramic Hybrid version has been developed with speed in mind. 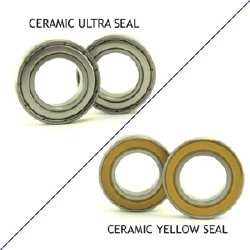 The Ultra Seal is a non-contact seal that also keeps these bearings maintenance free and lubed for life, but without the resistance typically associated with a sealed bearing. Most off-road and mountain biking applications call for the Yellow Seals and most on-road or road biking applications should use the Ultra Seals. Boca Bearing's Lightning Series Ceramic Hybrids are competitively priced, allowing every serious rider the opportunity to use the ceramic technology, which was previously reserved for the top Professional Team riders. According to Zipp, ceramic bearings result in: "[an average reduction in wattage of three (3) to four (4) percent... for a cyclist developing 250 watts, that's a savings of approximately 10 watts. [And at any level of competition, that is significant." Now everyone can enjoy the advantage of Lightning Bearing Technology (LBT) by Boca Bearings. Media samples for review are available upon request and high resolution images can be downloaded from the link below. Download or call for your free Boca Bearing Bicycle Cross Reference guide. Dealer Programs Available!